Hey there! My name is George Brooks, and I'm one of the founders here at Crema. We’re a digital product agency that works with companies all over the world to build product teams, designing, developing, and helping product manage solutions from ideation all the way through to growth. I wanted to discuss eight lessons that we've learned while growing product teams here at Crema and with our clients. There are a number of things that we've done accidentally right, some things that we probably haven't done really well, and some things that we've learned don't work as well. 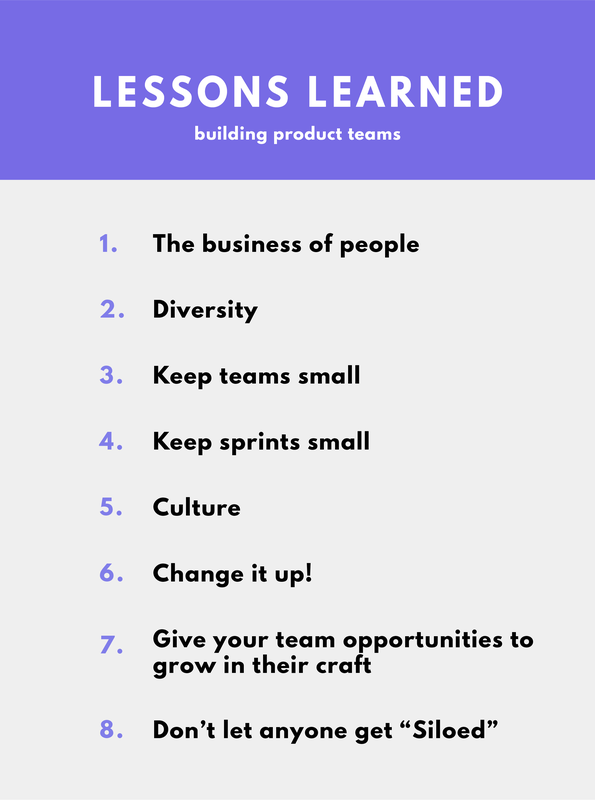 I want you guys to avoid those pitfalls, so we're going to give you these eight tips and tricks to help you build your product teams or work with people that are building product teams. First off, let's point out what may not seem obvious: You are in the business of people. You just happen to be building apps. We try to over-amplify technology, either because we assume it's going to replace our jobs or because we think it's going to make our life easier. And in some ways, some of those things might be true. But really, what we want to be focused in on is the fact that technology doesn't happen without people. This means you really have to be focused on your teams, which is why Crema strives to focus on our product teams rather than the technology we use. The key takeaway here is to stop getting stuck on the technology. Think about your people. You're in the business of people. Something we're noticing across the industry as a whole is that there's a big emphasis on diversity. Diversity can be a lot of different things. 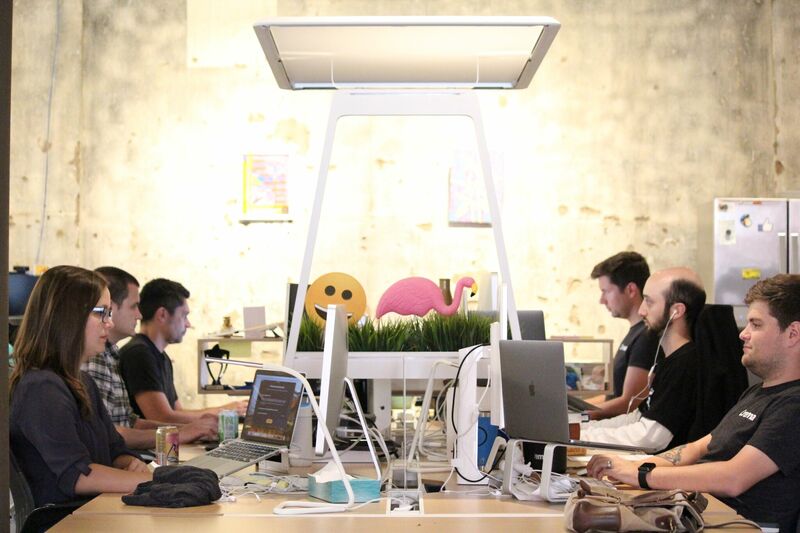 For us, it really comes down to cross- discipline teams--Working with people that are in different roles under one single unit or one vision of the product that they're working to build. There’s the diversity of cross discipline teams, but there's also the diversity of backgrounds, perspectives, and culture as you're building out your product teams. Avoid teams where everyone looks the same. Having males and females, people from different ethnic backgrounds, and people who speak different languages on your teams can really add to the value. Why not get as many perspective as possible to make the best product possible? You might have somebody that says: "That's a really great idea…If everyone is ‘this’ and ‘this’." But as soon as you introduce some diversity into the group, you start looking at things through a different lens. Then, you see things that maybe you wouldn't have been able to see on your own. Keep teams small and keep sprints small. Companies have grown massively in the last few years, but startups (especially technology companies) are just taking off. This growth has resulted in massive teams, but the companies seeing the most success are the ones that create small, focused teams. Most of our teams are no more than three to five people. That doesn't mean that all five team members are 100% dedicated to one project—You might have them floating between jobs. But the reality is that you keep that team small so that you don't fall prey to "group think." Instead, you can make decisions, you can move quickly, and you don't have to get this cross buy-in that can that can really weigh down the velocity of your project. Just as important to the success of your company is keeping sprints small. So instead of casting a vision for a roadmap of what you want to do over the next year, focus more on what you're going to have to do in the next week or two. Culture is a major make-or-break for these smaller sprints. One factor to consider when you're building your product teams (and especially when you start to have diverse views) is that you really have to be careful to make sure that their culture stays healthy as you create each new team. You may find that your first team (the founding team or the the champion team inside your organization) is tight knit, because they've all bought into the vision. But as you start to build new teams, it's easy to let that slip and just think, "Culture will probably come, because everybody's going to act like we did." But it's just not true. You have to train people so that they work well together. With diverse backgrounds and perspectives, tension is hard to avoid. One of the things that we look for and talk a lot about is a term we call "Humble Confidence." We really suggest that if you're looking to build your teams, you should look for teams that can stay confident. You want teams that know how to build the best solutions with great ideas, but you also want to be sure they're humble enough to take input from other people. If you have that one person that's not fitting or is causing strain in the team, do something about it quickly. Have a conversation with them. They may not even realize they're doing it. We’ve been through similar situations in the past, and we’ve seen firsthand how toxic it can be when someone on the team isn’t a good fit. It's not that they were bad at their job--they were very intelligent people. But they weren't a good cultural fit. They didn’t know how to work well with our diverse team, and it ended up dragging the whole team down. It wasn't until that person was removed and the problem was recognized that we saw the weight lifted off the product team. We couldn’t believe how much faster they moved, how much more efficient they became, and how much the product improved. Consider changing up your teams every once in a while. Over a long period of time, people tend to get kind of stagnant. Not bored exactly, but they can get used to being with the people they're around and the idea that they're working on. We don't have a process that's fixed in place yet, but we have found ways to work around this. When our teams had to be shuffled around (either because of a new hire or an employee leaving), we actually found that there was more gain out of that change than loss. Team members worry that by changing up the team, there won't be this knowledge background of what they've all been doing for the last year (or whatever time frame the project is). They fear that it's going to take the new team member too much time to get brought up to speed. What we actually found is that it brought fresh perspective. You start to see things that maybe you didn't see before because everybody was on the same wavelength. Things had been happening in the same way over and over and over again, and the whole team had developed tunnel vision. Consider some type of rotation or change-out of resources that are working on one particular problem. Bring somebody new in to help rejuvenate innovation, prompt necessary pivots and refine direction. Look at ways to give your team members and these cross discipline roles a way to get better at their craft outside of this particular project. That might mean sending them to a conference, or it might mean giving them time to continue to train. At Crema, we have craft teams as well as product teams/project teams. What that means is that members of a product team are working with people in different roles. Remember that a diverse team helps move the product forward! "How are other people designing with Sketch today or with Invision or Studio?" What we do here at Crema is give our craft teams (or ‘trade teams’) a space and a time to meet and grow together. For us, that looks like ‘Dev Chats’ that happen every two weeks, or ‘Designer Chats’. Product strategists have ‘Strat Chats’, and product managers have ‘Product Management Improvement’. Create a space for the people that don't get to spend time together on a day-to-day basis. Give them time where they can actually meet with other people that do the same thing they do. That way, they can get better at that craft together. It's a way to make sure that your product team doesn't become stagnant in the way that they do things daily. All these things that I've shared so far have been things that we've either accidentally fell into or things that we’ve realized by observing our employees. We noticed that people were getting stuck on one project for too long; They were going good work, it just seemed like they were feeling a little stale. Because of this, we made it a practice to constantly ask things like "How can we get them out and help them to do better?" I think that leads to the One Point of Failure: feeling siloed. Anybody that's completely siloed kills a product team. This naturally can happen because of personality. One person might be a little bit more reserved or introverted, so they shy away from collaborating with the rest the team. It's not a bad thing, but what it leads to is the siloed team member starting to make decisions on their own. They start running in a different direction, and they miss alignment with the vision or purpose of the project/ solution/ company. You can nip this in the bud by keeping your eyes open. Go with the lean methodology of watching for inefficiencies, and be on the alert for anyone that might start to become "siloed”--someone who's just not getting up from their desk very often or someone who's not engaging in the meeting. See what you can do to pull information out of that person and invite them into the collaboration of the team. Look for ways to do silent activities. When brainstorming, prevent it from being a vocal challenge of who speaks the most. The loudest voice shouldn’t always win. Instead, do exercises where you put sticky notes up on the wall, and think about how you can vote to make sure everyone has an equal say. Give team members who may be susceptible to being siloed a voice by allowing them to write things down. If you have the budget and the capacity to do this on your teams, think about how you can pair up programmers. Pair programming has been around for a long time, and for good reason. Essentially, both programmers sit down and look at the same set of code. One person writes while the other person reviews and asks questions about why are they writing the code that way. Then, the programmers switch places. The final result of the code is a better quality product. Even though you may think, "Well that's going to double up on time", it actually creates more efficiencies; People aren't spinning their wheels for no reason! They're not getting stuck, so they can move forward faster. "Well how are we going to run this next meeting?" "How are we going to put together this plan or this roadmap for this particular project, so we can communicate it with the stakeholders, so that we can communicate it with our bosses?" By nature of having two minds thinking about how that might be done, you can keep people from getting siloed into "there's only one person has all the knowledge". If someone on your team got hit by a bus (God forbid), you wouldn’t want all that knowledge that only they had wasted. However, you may not have that luxury to share all this information. It may be that your team is so early and so small that you don't have enough bodies. But it’s important to be on the lookout for those single points of failure as soon as possible. Start getting cross discipline collaboration at the get-go, so that you get a better result. Look for ways that you can collaborate with other people, and your product teams will be better for it. These are just a few lessons learned from a company that’s been building product teams for years. We believe helping our clients build their own product teams should be our agency’s fishing pole. If you're thinking about building a cross-disciplined, small product team that can move fast and build great solutions, we hope this has helped!